Women in Construction week just wrapped up. I went to as many events as I could. For me, I looked at it as a learning experience to hear the voices of women in construction and the trades. What I heard was both heartening and disheartening. While progress has been made, there are still many barriers to women and people from communities of color feeling welcomed into construction and the trades. According to this Gallup Diversity and Inclusion Perspective Paper, 45% of US workers report that they have experienced some form of discrimination or harassment in the past twelve months. Based on the massive shift in employee demographics (White, mostly male, baby boomers retiring and increasingly diverse Millennials filling the ranks) in construction and the trades, I imagine that if we looked solely at underrepresented groups in construction and the trades, we would see a much higher number. Organizations are exposed to public outcry when they fail in regards to diversity and inclusion. Bringing in the best and brightest talent and retaining them is necessary to stay competitive. The workforce is increasingly becoming more diverse. Points two and three bring us to Millennials, the largest part of our current workforce. Millennials are basing application and employment decisions on more than a paycheck. They are looking at an organization’s culture, values, mission as well as their relationship with leadership in the company. In the early 2000s, companies started leaning into diversity. This was often related to compliance, not to inclusion. These companies were often either given federally mandated targets or were trying to avoid litigation. This meant that the door to the company was opened, but not necessarily that anything changed on the inside of the company to make the new and diverse employees feel welcome. What we see today in some places is that the hard work of changing ourselves and our work cultures to be more inclusive hasn’t been done. This is why I believe you need to lead with inclusion which will lead you to diversity. Being diverse is not enough. What we want to see is a change from a compliance-driven diversity program to an inclusive, welcoming environment. Diversity is who comes through the door. Inclusion is whether they feel welcome. Being welcome means you feel valued, recognized, accepted and are encouraged to participate. Do your employees know how they are unique and how that contributes to their team’s/company’s success? This is where a strengths-based approach to employee development can help companies be more inclusive. Many companies look at strengths-based development solely through the lens of leadership development. It does that and it can move the dial to increased inclusion. Increasing the self-awareness of your employees. They know their strengths, they understand what they need to be successful and what they bring to the table. Creating a neutral, common language for employees around how they work, what they need to be supported, and how they contributed. This common language not only helps them understand themselves. They are also able to recognize how others work and the value others bring to the organization. This common language creates greater collaboration. Crucial conversations around diversity and inclusion are easier with a neutral, common language. Managers who are open to learning about difference and specific employee’s experiences foster trust that contributes to inclusion. 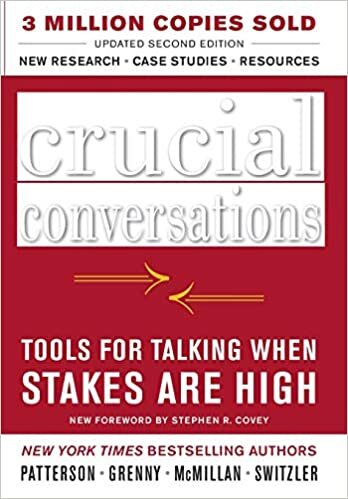 I have been reading a book that was recommended reading from last summer’s CliftonStrengths Summit: Crucial Conversations. How many times have you gotten wrapped up in, turned around, left out of or ended up feeling any number of negative emotions because an important conversation went poorly? Thankfully, for me this doesn’t happen a lot. But, when it does happen, it does not go well. While I don’t want to go into the entire book in this blog post, I do want to cover this idea of catching a conversation as it turns from a normal to a crucial conversation. Since you can only directly impact your part of the conversation, the place to start is with yourself. The authors draw a connection to first-aid. If you recognize a cut when it is small, if treated early, it can heal easily. However, if it is not treated and becomes infected, it can take a much longer time to heal. The sooner you recognize a conversation is not going well, the easier it is to right the conversation. Of course. There is a short quiz in the book that helps you identify they way you react to crucial conversations under stress. There are two main categories: Silence and Violence. Silence – you prefer to walk away from a conversation (there are many ways to do this). Violence – you try to force your view upon others (again, many ways this happens). I took the short quiz in the book to help identify how I react when conversations turn crucial. It turns out I react in two somewhat contradictory ways: I withdraw or I try to control. Controlling – you try to push/pull others to your viewpoint. The whole point of this book is for you to develop the skills you need to be able to have any conversation, at any time, anywhere. I want that for myself and I would like to be able to help others as a coach do this too. So, I did some deep dive thinking into how I can recognize in myself when conversations turn crucial. I think the biggest thing I notice is my breathing gets shallow. If I can do quick first-aid and take deep breaths as soon as I notice my chest is tight and I am not breathing deeply, I can begin the process of turning a crucial conversation around to a positive direction. What are your own cues that you are heading into a crucial conversation? And what can you do to turn things around at the beginning? How many times have you been a part of a conversation that starts with a compliment of some sort and ends with the a phrase that included the word “but?” If you are like me this has happened to you many times. And at the end of the “but” statement you feel like the compliment just evaporated. Likely you felt like this raccoon searching for his dissolved cotton candy. Where did that compliment go? It was just here. Help people feel heard in general and more specifically in contentious conversations. You: I came across this great new marketing tool. We could use it at the big fair we have coming in in the fall to promote product X. Boss: Yes, that sounds like a great idea, but we don’t have the money in the budget. Boss: Yes, that sounds like a great idea! Can you pull together some information on how much it will cost and what we can expect our return on investment to be? We don’t have new money on the budget and maybe we can find an opportunity to move money around. And if you make an informed decision to not purchase this new marketing tool, your employee knows why. And, you have created an environment where your employees are looking out for ideas that will help your business AND will share them with you in the future! How will you adopt this pivot from “Yes, but” to Yes, and”? Eleven members of Forbes’ Coaches Council weigh in on the assessments executives should take. Yes, the CliftonStrengths assessment is at the top of the list! And, no, this assessment is not just for executives. It is for anyone who wants to know themselves, be their best and do their best work. Many people, myself included, have found this assessment to be highly impactful. I think the reason is that it helps you dig through the clutter of what you are told to do, told to be, your aspirations and failures and pulls out the gold nuggets of what you naturally do best. Not everyone works from their greatest strengths. Think about coming home from school with a report card. On your report card are 2 As, 4 Bs and 1 F. How much time gets swallowed up on the F? How do you feel at the end of that conversation? Not to say the F shouldn’t be part of the conversation. But, how would the conversation change if you led with the As and Bs and followed with the F? While we all need to get through elementary and secondary school , we don’t all have to be great at everything. In fact, none of us is great at everything. We each have unique talents that we are naturally great at. If we foster those talents and invest in them, they can become our greatest assets. They become our strengths. When I think about why we focus on strengths, I am brought back to this eye opening example given in the Certified Coaches training. The research was done in the 1950s, which seems old, but I think the point is still highly relevant, so stay with me. This Gallup white paper is a great overview of the speed reading study I am going to quickly summarize. 1. The best students who had the best teachers did the best. 2. The students most talented at speed reading saw the most significant improvements after the interventions. Average readers on average made a gain of 66%. Talented readers on average made a gain of 828%. This is why we invest in talent. If you are striving for excellence you will get there through talent. You can see modest (sometimes good) gains when you focus on weakness. You will never see the kind of gain made by those talented readers if you focus on weakness. Onward towards excellence!